Argentinian architect Ciro Najle has spent the past several years designing more efficient fog collectors, vast nets that allow people in arid regions to gather water from moisture in the air. And recently, he worked with local crafters to translate the complex fractal mathematics of cumulous clouds into crochet. The luminous, fascinating results are now on display in Paris art/science gallery Le Laboratoire, and New Scientist's Kat Austen visited the show. 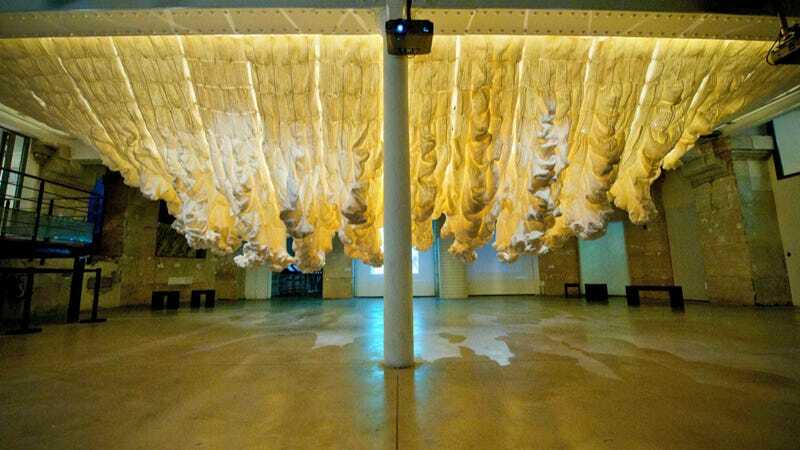 Though there are many types of cumulus cloud, they are all united by their fractal nature, which prompted Najle to turn to crochet to capture their complex, cauliflower-like topology. Najle says crochet is the perfect medium for representing fractal structures because its surfaces can be subdivided again and again by varying the length of neighbouring crochet lines . . . The sculpture comprises crocheted squares, each of which has an individual pattern modelled by Najle, who generated 1664 different diagrams pinpointing the intersections of the woollen strands, the crochet knots that are key to its structure.